for an 18 day homestay program. 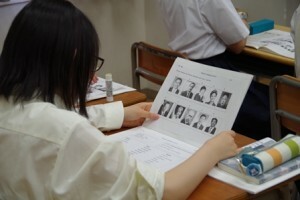 The girls studied hard during the months before going to prepare themselves. Once there, in addition to their regular classes, they interviewed the local town’s people and made presentations based on what they learned. In the afternoons, they enjoyed playing sports and doing arts and crafts with students from other countries or going on half-day excursions. They visited many famous sites in London, Oxford, Canterbury, Dover, Greenwich and more. The girls made many new friends and experienced British family life at their homes. It was truly a fun-filled program to envy!! 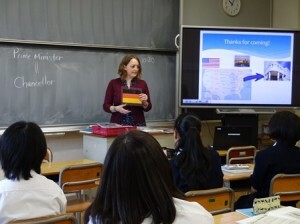 After returning back to school in Japan, the girls gave speeches to their friends, parents and teachers telling about their adventures and showing their gratitude to their parents for giving them this opportunity of a lifetime. Check out the photos on the blog! 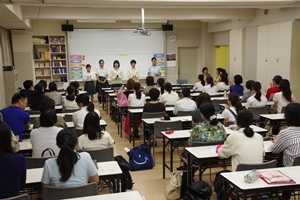 This weekend on the afternoon of Saturday, September 9th, here at Tokiwamatsu, we are having an open house (school) where just the students are introducing the school, giving tours and prospective students can come and try out some of our clubs even! We would love to see you there!! Till next time, we wish you and yours the best. Hi everyone! How are you enjoying the warm weather? Today I would like to tell you about my Global Studies lesson. Today students studied about World Leaders. Using the interactive whiteboard, the students participated in an interactive power point presentation, learning the correct English country names, regions; their flags and each country’s leader. Everyone had a good time answering the quizzes and using the fun whiteboard! Copyright © 2018 トキワ松学園 All Rights Reserved.